Urban gardeners usually have to work with smaller spaces. Dwarf conifers can be smaller or miniature species that come in all sorts of colors, textures, colors form and shapes. They add visual interest and character to a garden. Limited space does not need to mean limited enjoyment. They are very versatile and work with many different garden types. They can accent water features. Use them in mixed plantings with annuals, bulbs and shrubs that change so much through the seasons. 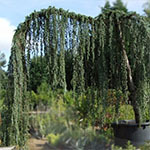 Weeping Blue Atlas Cedar pictured above provides a striking shape along with the blue green needled foliage. Others such as the Golden Dwarf Hinoki Cypress can bring beautiful yellow accented foliage to the garden. What if a plant order is not in stock? What are the ways to own it?